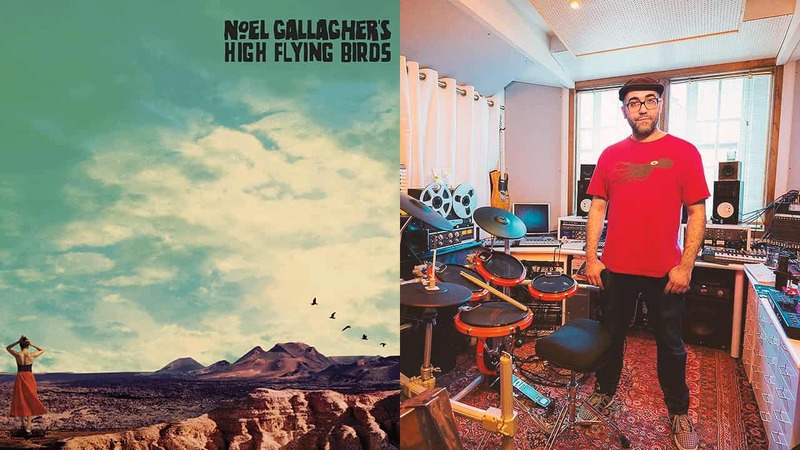 Emre Ramazanoglu (David Holmes, Carly Rae Jepsen, Lily Allen) breaks down drumming, engineering, and taking Noel Gallagher's High Flying Birds on the experimental fringe of music production for the making of Who Built the Moon?. 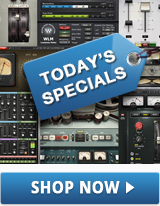 Login to download Emre’s personal presets for Abbey Road Plates, Abbey Road Vinyl, C1 Compressor, C6 Multiband Compressor, and Kramer Master Tape plugins. Drummer, producer & musical renaissance man Emre Ramazanolgu is no stranger to creating hit songs. Whether it's songwriting for Sia and Lily Allen, drumming and programming for William Orbit and Duffy, or mixing and engineering for The Prodigy, Tricky and now Noel Gallagher, Emre has been collaborating with some of the music industry’s biggest stars. We got the chance to sit with Emre and learn how he and producer David Holmes got Noel Gallagher to explore new sonic territories on a psychedelic, multi-genre trip to the moon. Starting out as a drummer & programmer, how did you become a mixing engineer? I got my start mixing while drumming and programming for the bands I used to play with. A couple of mixes would end up in my hands, and I’d take em’ home. Back then I had a Digi 001, and I’ve really been mixing ever since. But I gained the understanding of the process of engineering when I got the chance to work for producer Jim Abbiss, [Adele, Sneaker Pimps, Artic Monkeys]. At that time, I was still a drummer and programmer. I sort of had my ears and eyes wide open all the time, watching everything. I was able be in the studio around Jim and some really amazing people that came to work there. I gained a lot of knowledge getting to hang out with Jim – it was a tremendous learning experience. I got stronger as an engineer, continued drumming and songwriting, and that sort of carried on to working with other people and building more contacts. 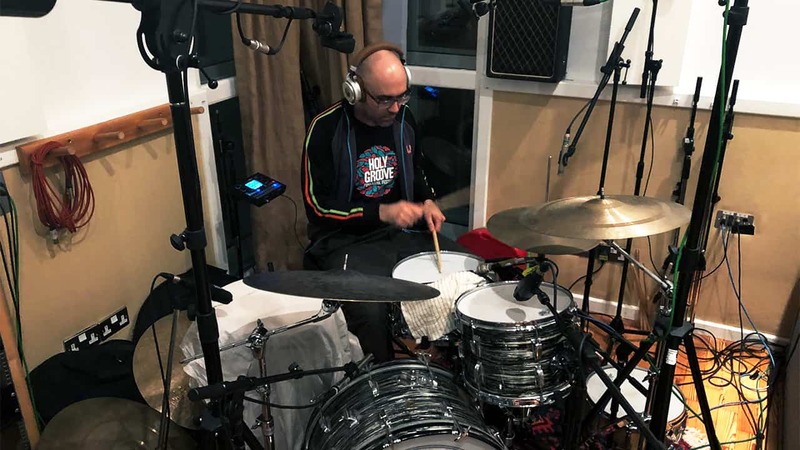 Being able to do many different things: session drummer, programmer, engineering, songwriting and producing led to more opportunities with other people – a brilliant fit for the way things happened in the music biz. You can no longer just do one thing anymore, can you? You took the album on an experimental, but exciting psychedelic departure from Noel’s previous work. How did you mix all the musical styles, and different genres together on Who Built the Moon? Well, David [producer David Holmes] actually started working on the album from scratch with Noel in Belfast long before I got involved. He really pushed Noel to step outside of his comfort zone and explore a new approach. One of the things he did with Noel was, they would just sit, play all kinds of different, rare and obscure records and have these long conversations about music. David, Noel and myself all share similar tastes in music. We’ve all got a really, really similar taste and we all like a lot of different stuff. We were constantly turning each other on into really cool, rare stuff as well. It was great. There’s heavy experimental, psych-rock influences; a Roxy Music sort of sound. Then you’ve got krautrock influences: bands like Can, mixed in with 80s, early 90s Madchester sounds that came from bands like Inspiral Carpets, The Happy Mondays, or The Stone Roses. Guitars mixed in with drum breaks, which became quintessential to the Madchester sound. It doesn’t sound like anything Noel and the band did before, and I think it’s great. The first song, “Fort Knox,” is actually inspired by Kanye West’s “Power” – a personal favorite of Noel’s. While going through the initial writing, Noel and David [Holmes] went for that kind of big, bold, almost shouting, chanting kind of vocal sound – which is definitely what we went for sonically as well. As both a performing drummer and engineer on this album: How did you record, mix and put together the massive drum sounds? On the tracks that I played the drums and mixed, [“Fort Knox,” “Holy Mountain,” “It’s A Beautiful World,”] I achieved those sounds by recording live takes, lots of re-amping, tape saturation and parallel processing. “Fort Knox” was quite cool. All of the drum performances on the album are actually live, unquantized takes that I went back and rearranged. It was really important for us to keep as much raw, human energy and feel as possible. Also, loads and loads of layering. I captured a lot of the sound of the actual PA in the room; there was a little bit of reinforcement, and then I mixed that back into all the room mics. The mix on the drums, for example, is a combination of contact microphones on the kick, snare and toms. I also used drum triggers, and re-amped those signals through all sorts of different vintage tube amps: tubes, tubes, and more tubes! I would re-amp a snare through something like an old Selmer amp to get that distinct crunchy sound, and then to a spring reverb. Or, I would send the kick trigger through a separate amp to either a different reverb or a space delay, giving the room mics this vaulted sound. I tend to do extreme processing on individual drum components themselves before they even getting to the drum buss. There are also two parallel compression stages to this process. I’ll send those to another drum buss where I’ll add a plate reverb like the Abbey Road Plates, making a kind of loud, splashy sound. So all of these layers are mixed together really. I like to color lots of different places with the sonics. I use a lot of layers to give it that kind of exciting, slightly gnarly, full-on energy. There’s an edgy, psychedelic fuzziness throughout the album. On “Holy Mountain,” for example, how did you get that lo-fi sound into a hi-fi mix? Yeah “Holy Mountain” was pretty big – a lot of tracks – with many of the elements in mono, so it was massively difficult to make it all fit properly. But luckily, I tend to commit to things really quickly when I’m mixing. So, I’ll take a 150-track session down to 30 or 40 tracks. My brain can’t cope with 150 live tracks. Committing to all those tracks is similar to skydiving [laughs]; bam, bam, bam, print, print, print: go, go, go! [laughs]. But, I mean, I only have myself to blame for this album because I pretty much tracked it also. I’ll parallel compress at each individual stage. There’s quite a lot of Kramer Tape used on the album. I like really fast, saturating tape speed with wow and flutter — it’s awesome for that. And then another level of parallel compression on the drum buss with tape saturation to smash it out, using a different plugin like Abbey Road Vinyl. I like to go for a sound with a warm burst of driven saturation; nothing else seems to do it quite as well as that. I have most of the channels sent to busses, where I often get quite aggressive with parallel and sidechain compression, and then some very immediate tape-saturated compression on the actual busses themselves. For additional dynamic control, I’ll use a sidechain compressor like the C1 Compressor as a tone shaper and then just dial a tiny bit in, because a little is a lot with that plugin. At the same time, I can keep quite a lot of transient information. To get that nice, chunky part out for Noel’s voice, when he’s really shredding his vocals, sidechain compression was great. I used the C6 Multiband Compressor for catching and evening things out. Or in another instance, if things get too harsh in the 2k or 3 kHz area, or on loud syllables, I just set the C6 sidechain on that frequency and smooth it out. It just hits and grabs and locks and does the right thing— it’s a killer split-band compressor. It was a quite complicated scenario actually: multiple mix busses, layers of things running with parallel compression, hitting different saturators in different ways. We did layers and layers of saturation. Abbey Road Vinyl is doing quite a lot of work on this album as a saturator, so everything gets kind of rounded off in an old, overdriven kind of way. I’m using a ton, especially on the mix buss. It’s absolutely amazing for immediately heading straight back to a retro sound. It’s incredible. We were very careful when making things fuzzy that we wouldn’t lose clarity. Through that, we achieved a sound that Noel really liked. It’s all based around a fuzz guitar actually, which is hard to really pull out distinctly as being the main thing. But it’s like one big fuzz guitar sound which we were going for at times. “It’s A Beautiful World” sounds like a monstrous drum break! How did you make a real kit sound like a vintage break? That drum sound was pretty much done on the day of the session and just stayed in the mix. Noel had already laid down all the guitars and a riff on that one in a previous session with David [Holmes]. I got behind the drums. David put a click up and said, ‘Play like a Can kind of beat.’ So I said okay, and we laid down the drum parts. I mixed the snare sound on that song using mostly the contact mics on the toms, with some serious parallel processing, and of course tape saturation using on the drum buss to get a brilliant and bold sound that I really liked—that slightly Can, krautrock experimental sound. Again, everything is played live. I then did another overdub of hi hats, cymbal mutes and things. Other than that, it’s just that sort of take, and then we edited that. 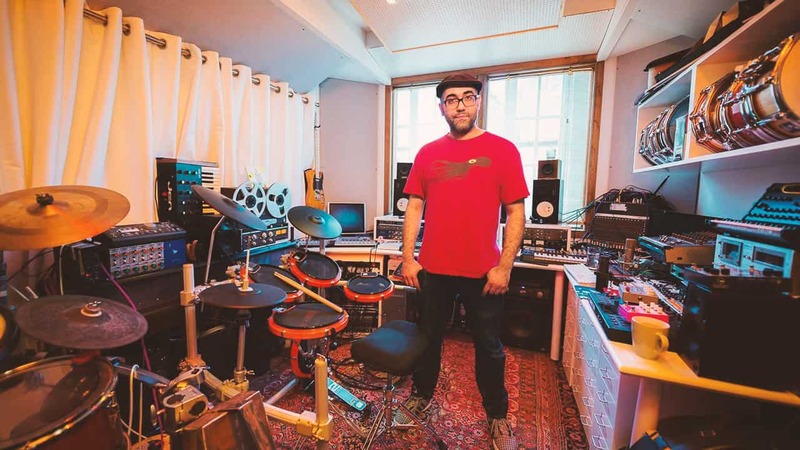 To make the drums a little more breakbeat-like, we kept the live thing – keeping the original sound but making it even punchier by hitting the sweet spots of all the compressors, pushing them until it pleased me and Noel the way we liked. So when has the eagle landed on the mix? When is it truly done? I think really on a crude level, if nothing bugs me in the mix then I’m done. I know I can push the sonics to pretty much anywhere where I want while I’m mixing. Depending on the style of music, I’ll ask myself things like: Is the vibe just perfect the whole way through? Is it feeling great the whole way through? I take lots of breaks. So I tend to always come back to the mix, constantly. I mean, there are some things I can just slave away on, like vocals. Otherwise, I’m coming back all the time. My advice is to take a little bit of time off from the mix, leave it, but keep coming back to it so you’re always hearing it fresh. Torturing yourself for twelve, thirteen hours in front of the monitors doesn’t really help. It’s all about coming back.